Tulsi Krishna is an aromatic, sacred plant native to India, Malaysia and Sri Lanka. It is one of four main forms of Tulsi that are generally recognized and cultivated for religious and medicinal purposes. 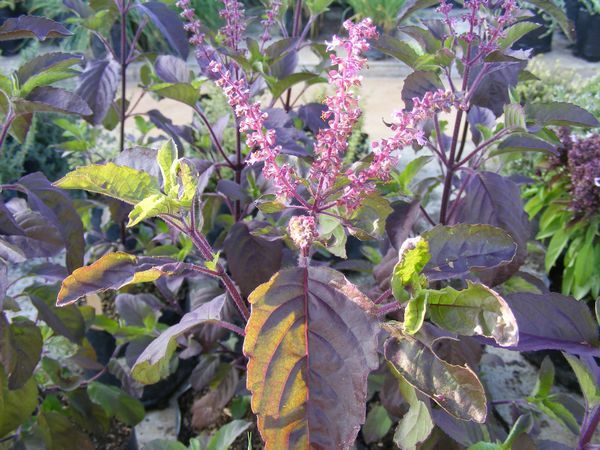 Tulsi Krishna is the specific variety grown in Hindu temples. It is a small shrub with purplish stems, olive/purple leaves with serrated edges and it bears small purple-pink flowers in summer. The leaves have a spicy pungent aroma that is used as incense and for flavouring. Pinch out flowering shoots regularly to extend the useful life of the plant. Add fresh leaves to salads, fruit dishes, jellies, preserves and sweet breads. Use in Thai cooking in stir fries with hot peppers, chicken, pork and beef. The dried leaves are an ingredient of Ethiopian spice mixtures. Seeds are soaked in water to make a cooling drink. Tulsi Krishna is used in traditional Ayurvedic medicine and considered an 'elixir of life' providing alchemy to one's well being. Tulsi Krishna is warming, has antiseptic qualities, clears bacterial infections, strengthens the immune system and is considered to be a tonic and adaptogenic. Tulsi Krishna is an excellent wellness drink to help quit drinking coffee. Tulsi Krishna is a good companion plant - it is said to repel flying insects and may help to keep tomatoes pest free.